Previous Month's Final ICS Reading: 98.0. "...Consumer sentiment retreated in late June to just above the May reading largely due to concerns about the potential impact of tariffs on the domestic economy. The falloff in confidence was minor, as the Sentiment Index has been virtually unchanged for the past three months. The persistent strength has been due to favorable assessments of jobs and incomes. While consumers anticipated rising interest rates during the year ahead, those expected increases were associated with a modest decline in longer term prospects for the national economy. For the year ahead, consumers still anticipated that the economy would produce small additional declines in the unemployment rate as well as higher wage gains. 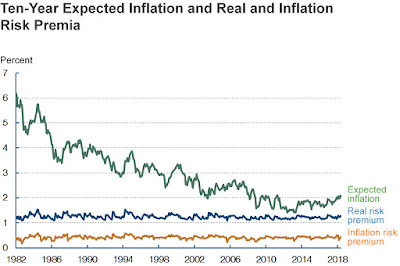 Consumers also anticipated an uptick in inflation during the year ahead, partly due to rising energy prices and partly due to tariffs. The potential impact of tariffs on the domestic economy was spontaneously cited by one-in-four consumers, with most expecting a negative impact on the domestic economy (21% out of 26%). The primary concerns were a downshift in the future pace of economic growth and an uptick in inflation. A longstanding belief of consumers is that trade with other countries results in a broader range of available goods at lower prices. When asked in a recent survey about their views on international trade, two-thirds of consumers thought that more trade with other countries would be better for the domestic economy (see the chart). To be sure, consumers' judgements about the impact of higher tariffs will not crystalize until they gain more experience with actual changes in product prices and domestic employment. While tariffs may have a direct impact on only a very small portion of overall GDP, the negative impact could quickly generalize and produce a widespread decline in consumer confidence..."
* = Chained dollars is a method of adjusting real dollar amounts for inflation over time, so as to allow comparison of figures from different years. The Commerce Department introduced the chained-dollar measure in 1996. Chained dollars generally reflect dollar figures computed with 2009 as the base year. The yellow-highlighted percentage represents the quarter-to-quarter change in the Gross Domestic Product for the United States. The "predicted" figure is what economists were expecting, while the "actual" is the actual or real figure. "...Profits from current production (corporate profits with inventory valuation adjustment and capital consumption adjustment) increased $39.5 billion in the first quarter, in contrast to a decrease of $1.1 billion in the fourth quarter. Profits of domestic financial corporations increased $7.0 billion in the first quarter, in contrast to a decrease of $14.6 billion in the fourth quarter. Profits of domestic nonfinancial corporations increased$28.8 billion, compared with an increase of $19.4 billion. Rest-of-the-world profits increased $3.7 billion, in contrast to a decrease of $5.9 billion. In the first quarter, receipts increased $20.9 billion, and payments increased $17.2 billion..."
Click here to view Pending Home Sales Index data. An index above 100 coincides with a historically high level of home sales activity. An index of 100 is equal to the average level of contract activity during 2001, the first year to be analyzed. Coincidentally, 2001 was the first of four consecutive record years for existing-home sales. 2001 sales are fairly close to the higher level of home sales expected in the coming decade relative to the norms experienced in the mid-1990s. As such, an index of 100 coincides with a historically high level of home sales activity. "...Pending home sales decreased modestly in May and have now fallen on an annualized basis for the fifth straight month, according to the National Association of Realtors®. A larger decline in contract activity in the South offset gains in the Northeast, Midwest and West. The Pending Home Sales Index, www.nar.realtor/pending-home-sales, a forward-looking indicator based on contract signings, decreased 0.5 percent to 105.9 in May from 106.4 in April. The lackluster spring, according to Yun, has primarily been a supply issue, and not one of weakening demand. If the recent slowdown in activity were because buyer interest is waning, price growth would start slowing, inventory would begin rising and homes would stay on the market longer. Instead, the underlying closing data in May showed that home price gains are still outpacing income growth, inventory declined on an annual basis for the 36th consecutive month, and listings typically went under contract in just over three weeks1. Yun now forecasts for existing-home sales in 2018 to decrease 0.4 percent to 5.49 million – down from 5.51 million in 2017. The national median existing-home price is expected to increase around 5.0 percent. In 2017, existing sales increased 1.1 percent and prices rose 5.7 percent. The PHSI in the Northeast increased 2.0 percent to 92.4 in May, but is still 4.8 percent below a year ago. In the Midwest the index rose 2.9 percent to 101.4 in May, but is still 2.5 percent lower than May 2017. Pending home sales in the South declined 3.5 percent to an index of 122.9 in May (unchanged from a year ago). The index in the West inched forward 0.6 percent in May to 94.7, but is 4.1 percent below a year ago..."
The yellow-highlighted figure represents the month-to-month change in new orders for durable or hard goods for immediate or future delivery from U.S. manufacturers. Examples of durable goods: cars, airplanes, computers, furniture -- items that are built to last at least three years. Consumers’ appraisal of current conditions was relatively unchanged in June. The percentage stating business conditions are 'good' decreased from 38.6 percent to 36.0 percent, while those saying business conditions are 'bad' also decreased, from 12.6 percent to 11.7 percent. Consumers’ assessment of the labor market was also mixed. The percentage of consumers claiming jobs are 'plentiful' decreased from 42.1 percent to 40.0 percent, but those claiming jobs are 'hard to get' also decreased, from 15.6 percent to 14.9 percent. Consumers’ optimism about the short-term outlook eased in June. The percentage of consumers anticipating business conditions will improve over the next six months decreased from 23.3 percent to 21.4 percent, while those expecting business conditions will worsen rose from 7.8 percent to 9.8 percent. Consumers’ outlook for the labor market, however, was slightly more favorable. The proportion expecting more jobs in the months ahead increased marginally, from 19.7 percent to 20.0 percent, while those anticipating fewer jobs decreased, from 13.1 percent to 12.6 percent. Regarding their short-term income prospects, the percentage of consumers expecting an improvement declined, from 21.4 percent to 18.8 percent, while the proportion expecting a decrease rose from 8.0 percent to 8.7 percent..."
Led by declines in production-related indicators, the Chicago Fed National Activity Index (CFNAI) fell to –0.15 in May from +0.42 in April. Two of the four broad categories of indicators that make up the index decreased from April, and two of the four categories made negative contributions to the index in May. The index’s three-month moving average, CFNAI-MA3, decreased to +0.18 in May from +0.48 in April..."
The yellow-highlighted, "actual" figure above represents the preliminary, seasonally adjusted annualized sales count of existing homes, co-ops and condominiums for the indicated month. The "predicted" figure is what economists were expecting, while the "actual" is the true or real figure. Click here for the Release Summary. "...Existing-home sales fell back for the second straight month in May, as only the Northeast region saw an uptick in activity, according to the National Association of Realtors®. Total existing-home sales, https://www.nar.realtor/existing-home-sales, which are completed transactions that include single-family homes, townhomes, condominiums and co-ops, decreased 0.4 percent to a seasonally adjusted annual rate of 5.43 million in May from downwardly revised 5.45 million in April. With last month’s decline, sales are now 3.0 percent below a year ago and have fallen year-over-year for three straight months. Properties typically stayed on the market for 26 days in May, unchanged from April and down from 27 days a year ago. Fifty-eight percent of homes sold in May were on the market for less than a month. Realtor.com®’s Market Hotness Index , measuring time-on-the-market data and listings views per property, revealed that the hottest metro areas in May were Midland, Texas; Boston-Cambridge-Newton, Mass. ; San Francisco-Oakland-Hayward, Calif.; Columbus, Ohio; and Vallejo-Fairfield, Calif. According to Freddie Mac, the average commitment rate (link is external) for a 30-year, conventional, fixed-rate mortgage increased for the seventh straight month to 4.59 percent in May (highest since 4.64 percent in May 2011) from 4.47 percent in April. The average commitment rate for all of 2017 was 3.99 percent. “The abrupt hike in mortgage rates this spring, along with price appreciation and competition being the strongest in the entry-level part of the market, is why first-time buyers are not as active as they should be and their participation remains below its historical average,” said Yun. First-time buyers were 31 percent of sales in May, which is down from 33 percent both last month and a year ago. NAR’s 2017 Profile of Home Buyers and Sellers – released in late 2017 – revealed that the annual share of first-time buyers was 34 percent. All-cash sales were 21 percent of transactions in May, which is unchanged from April and down from 22 percent a year ago. Individual investors, who account for many cash sales, purchased 15 percent of homes in May, unchanged from last month and down from 16 percent a year ago. Distressed sales – foreclosures and short sales – were 3 percent of sales in May (lowest since NAR began tracking in October 2008), down from 4 percent last month and 5 percent a year ago. Two percent of May sales were foreclosures and 1 percent were short sales..."
"...Industrial production edged down 0.1 percent in May after rising 0.9 percent in April. Manufacturing production fell 0.7 percent in May, largely because truck assemblies were disrupted by a major fire at a parts supplier. Excluding motor vehicles and parts, factory output moved down 0.2 percent. The index for mining rose 1.8 percent, its fourth consecutive month of growth; the output of utilities moved up 1.1 percent. At 107.3 percent of its 2012 average, total industrial production was 3.5 percent higher in May than it was a year earlier. Capacity utilization for the industrial sector decreased 0.2 percentage point in May to 77.9 percent, a rate that is 1.9 percentage points below its long-run (1972–2017) average..."
The Federal Reserve Bank of Cleveland reports that its latest estimate of 10-year expected inflation is 2.04 percent. 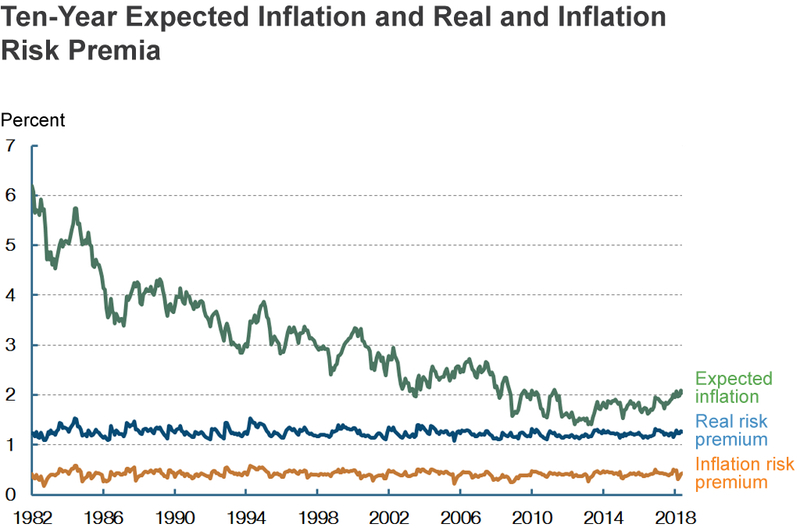 In other words, the public currently expects the inflation rate to be above 2 percent on average over the next decade. The previous month's SBOI reading was 104.8. "...The Small Business Optimism Index increased in May to the second highest level in the NFIB survey’s 45-year history. The index rose to 107.8, a three-point gain, with small businesses reporting high numbers in several key areas including compensation, profits, and sales trends. 'Main Street optimism is on a stratospheric trajectory thanks to recent tax cuts and regulatory changes. For years, owners have continuously signaled that when taxes and regulations ease, earnings and employee compensation increase,' said NFIB President and CEO Juanita Duggan. -- Compensation increases hit a 45-year high at a record net 35 percent. -- Positive earnings trends reached a survey high at a net three percent. -- Positive sales trends are at the highest level since 1995. -- Expansion plans are the most robust in survey history. In another interesting marker, a net 19 percent of small business owners are planning price increases, the highest since 2008 and a signal of a strong economy. A net three percent reported positive profit trends, up four points and the best reading in the survey’s history. In addition, a net 15 percent reported higher nominal sales in the past three months, up an astonishing seven points and the sixth consecutive strong month for sales. Small business owners continue to hire with a seasonally-adjusted net 18 percent planning to create new jobs. Twenty-nine percent of owners have job openings for skilled workers, the third highest reading since 2000. Twelve percent have job openings for unskilled workers, with the strongest demand in the transportation, travel, communications, and utilities sector. To compete in the job market, 35 percent of owners reported increases in labor compensation to attract job applicants. The percentage of owners reporting capital outlays moved up one point to 62 percent, with 47 percent reporting spending on new equipment, 24 percent acquiring vehicles, and 16 percent improving expanded facilities. Thirty percent plan capital outlays in the next few months. Access to credit continues as a non-issue with 37 percent of owners reporting all credit needs were satisfied and 43 percent saying they were not interested in a loan, down seven points from last month and the lowest reading since 2007. Only one percent reported that financing was their top business problem. Owners planning to build inventories rose three points to a net four percent, the nineteenth positive reading in the past 20 months. As reported in NFIB’s May jobs report, 23 percent of owners cited the difficulty of finding qualified workers as their Single Most Important Business Problem, followed by taxes at 17 percent and regulations at 13 percent. Fifty-eight percent reported hiring or trying to hire, up one point from last month but 83 percent of those reported few or no qualified workers..."
"...Claims taking procedures in Puerto Rico and in the Virgin Islands have still not returned to normal..."
"...Economic activity in the non-manufacturing sector grew in May for the 100th consecutive month, say the nation’s purchasing and supply executives in the latest Non-Manufacturing ISM® Report On Business®..."
April 2018 New Orders: $494,400,000,000. "...Economic activity in the manufacturing sector expanded in May, and the overall economy grew for the 109th consecutive month, say the nation’s supply executives in the latest Manufacturing ISM® Report On Business®..."
Estimated construction spending during April: $1,310,400,000.